Xerosis, comes from the Greek, meaning Dry. Xerosis is the medical term for Dry Skin. It can occur at any age, to different degrees and for many different reasons. Most people experience it at some stage in their life. Dry Skin or Xerosis is very common. It is important to understand the causes to enable you to tailor a good routine for your particular skin. It usually becomes worse in the winter months or in cold climates and if left untreated it can lead to dermatitis or other skin conditions. It can be itchy, flaky, rough, tight and it can look rather unpleasant. Dry Skin isn’t usually serious, but it can be an annoyance and unsightly and cause people to feel less confident in themselves. · Poor hydration - Not enough water intake on a daily basis. Most of us should be drinking more water than we do. · Aging - As we get older we tend to have diminished amounts of natural skin oils and lubricants. · Environment - When humidity is low in the winter and sometimes during a particularly hot summer. · Pollution - Air pollution can dry our skin out. · Washing the skin too frequently - Disrupts the skins natural balance. You should also not scrub too hard. · Washing with harsh products - Like soaps, sanitizers, detergents. · Itchy clothing - If your clothes cause you to itch this can cause dry skin. · Sunlight - Over time, with prolonged exposure to the sun, this can cause permanent damage. – UV rays increase the water evaporation from the skin leaving it dry. · Poor Diet or Malnutrition - We get a lot of vital nutrients, vitamins and minerals from our food which supports our skin, so it is essential to eat a balanced, healthy diet. · Medication– Can causes the body to become more dehydrated. · Long Hot Baths/Shower– When we do this frequently, we dehydrate ourselves. · Other medical issues– Such as diabetes and hypothyroidism can be a cause of dry skin. · Psoriasis - is a fairly common skin disease marked by red, itchy, scaly patches. Psoriasis occurs when skin cells are replaced more quickly than usual. It is usually found on the elbows, knees and scalp but can affect other areas of the body. It tends to appear as red or pink small scaly bumps that merge into plaques of raised skin. · Eczema - is also known as Dermatitis. The name Eczema comes from the Greek ‘ekzein’ which basically means ‘to boil. The condition varies quite dramatically depending on the individual. 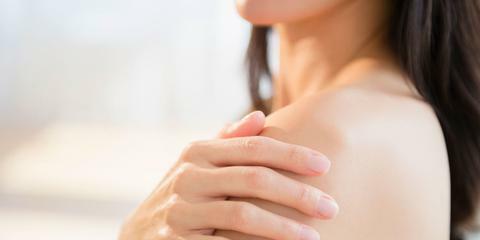 With mild cases of eczema, the skin is dry, scaly, red and itchy. In severe cases the skin can begin to crust and even weep and bleed. Eczema can occur in all ages, but it is primarily seen in children. G16 Skin Repair lotion is specially formulated to treat dry skin 'Xerosis' and is described as the best solution available on the market today. Thousands of people are using G16 Skin Repair lotion successfully and the results are extremely fast and truly outstanding. We are confident you will be more than happy with the results. G16 Skin Repair Lotion has been developed to loosen and remove the stubborn, dry skin cells that are attached to the outer layer of the skin using carefully selected natural acids. It then completely nourishes the new skin underneath leaving it hydrated and soft. The essential oils and vitamins in the lotion are deeply absorbed into the skin giving it the correct hydration and elasticity it needs to become smooth and radiant. G16 Skin Repair is an excellent treatment for mild to severe types of dry skin conditions sand you will not be disappointed.